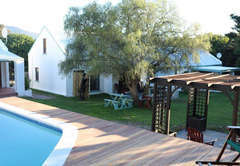 Goose Green Lodge is a B&B with self catering option, providing accommodation in Noordhoek for tourists visiting the Atlantic Seaboard region. 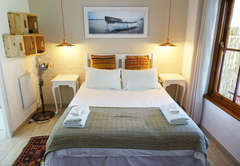 Tucked away between sheltering trees lies a hidden Noordhoek gem: Goose Green Lodge. 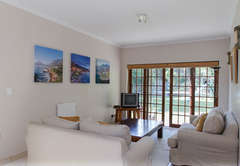 We offer a choice of self catering Cape Town accommodation or cottages, ensuring privacy and flexibility, while still offering all the little luxuries enjoyed by bed and breakfast guests. 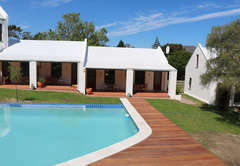 Not only is there a brand new refreshing rim flow pool which is solar heated, and a braai (BBQ) facilities, but also a shady gazebo and plenty of spots to curl up with a book. The garden is large, with a jungle gym, slide and swings for the kids, and Bella and Roxy our friendly Bullmastiffs. 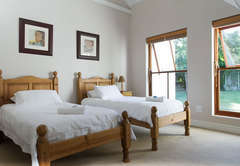 Our double / twin en-suite bedrooms have their own entrances and furnished patios looking out onto the garden and swimming pool. 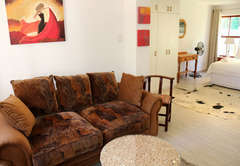 They have coffee machines, flat-screen TV with satellite channels and electronic safes for extra peace of mind. 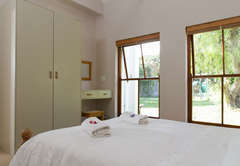 All 4 of the rooms have had a major upgrade with new bathrooms with walk in shower. 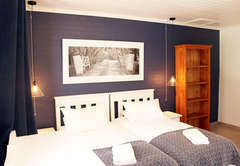 All guests have access to the comfortable guest lounge in the main house, with lots of books, magazines, DVDs and board games. 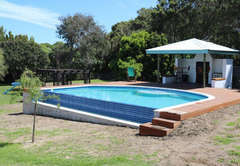 It has just been rebuilt and completed with new bathroom with walk in shower, and his and her basins. It has a fully equipped kitchen with a stove. 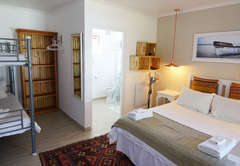 It has a Queen-size bed, bunk beds, lounge with a flat screen TV, DStv and Wi-Fi. 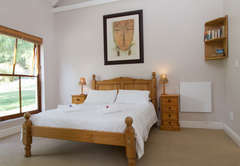 Our two cottages are located next to each other at the bottom end of our garden. 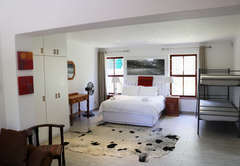 Guinea Fowl Cottage is the larger of the two and has a spacious master bedroom and a twin bedroom, both with en-suite bathrooms. 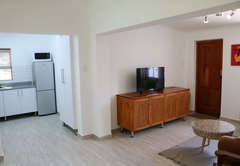 A spacious lounge and dining area and a stylish kitchen ensure that you enjoy all the comforts of a home away from home. 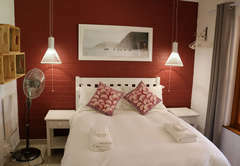 Sunbird Cottage, the cosy and colourful second cottage, has a master bedroom, a twin bedroom and bathroom with bath and open shower. 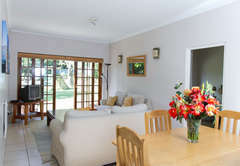 The airy conservatory opens out to the garden, and a fully equipped kitchen and breakfast nook rounds off the picture. 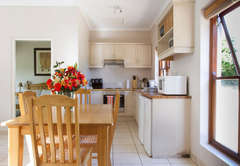 Each cottage has satellite television, and all the glassware, crockery, cutlery and cooking equipment a family would normally need. 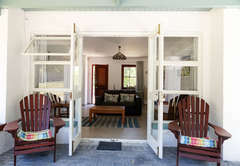 Breakfast is normally included and is served, whenever possible, on the verandah overlooking the garden. 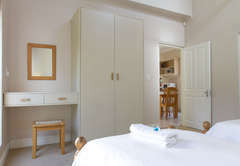 Breakfast consists of fresh fruit and fruit juices, cereals and yoghurt, delicious breads and jams, cold meat and cheeses, with a hot option always on offer. Our omelettes are especially good. We offer general business services and can provide a laundry service upon request. 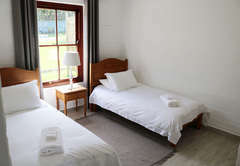 Standard Room with en-suite bathroom (shower) with DSTV, safe and coffee making facilities, free WIFI, fridge,fan and microwave. All rooms have entrances on to the patio with the garden beyond. Breakfast a 250m walk/drive to local restaurant. 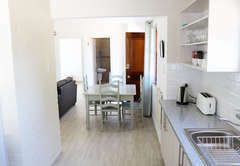 Self-catering suite with DSTV, brand new kitchen and bathroom. 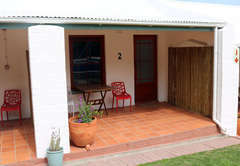 It has just been rebuilt and completed with new bathroom with walk in shower, and his and her basins. 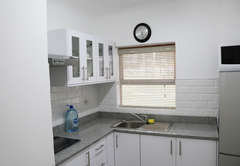 It has a fully equipped kitchen with a stove. 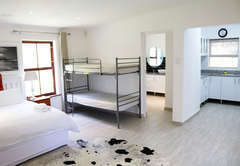 It has a Queen-size bed, bunk beds, lounge with a flat screen TV, DStv and Wi-Fi. 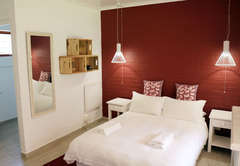 Self-catering cottage with 2 rooms with en-suite bathrooms each, main double room with shower, twin room with bath, fully equipped kitchen, dining area, lounge with DStv and safe. 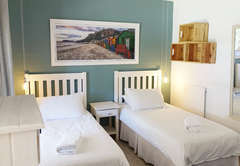 Each cottage has satellite television, and all the glassware, crockery, cutlery and cooking equipment a family would normally need. 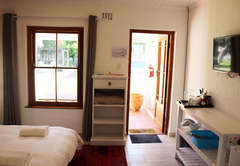 Self-catering cottage with one double and one twin room, shared bathroom with shower and bath, heated towel rail, fully equipped kitchen, safe, dining area and lounge with DStv. 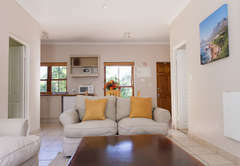 Each cottage has satellite television, and all the glassware, crockery, cutlery and cooking equipment a family would normally need. Response timeGoose Green Lodge typically responds to requests in 5-10 minutes.